Here is a panorama. Click on the image for the larger file (11 MB jpg). These are materials in support of this field exercise. Aalto, F.R.., 2006. Neogene Stratigraphic Evolution of Northwestern California, in Hemphill-Haley, M.A., McPherson, R., Patton, J.R., Stallman, J., Leroy, T., Sutherland, D., and Williams, T., eds., 2006 Pacific Cell Friends of the Pleistocene Field Trip Guidebook, The Triangle of Doom: Signatures of Quaternary Crustal Deformation in the Mendocino Deformation Zone (MDZ) Arcata, CA. Compton, Robert R., 1985. Geology in the Field. Wiley Press, New York, pp. 229-234. Chapter 11. Delattre, M. and Rosinski, A., 2012. 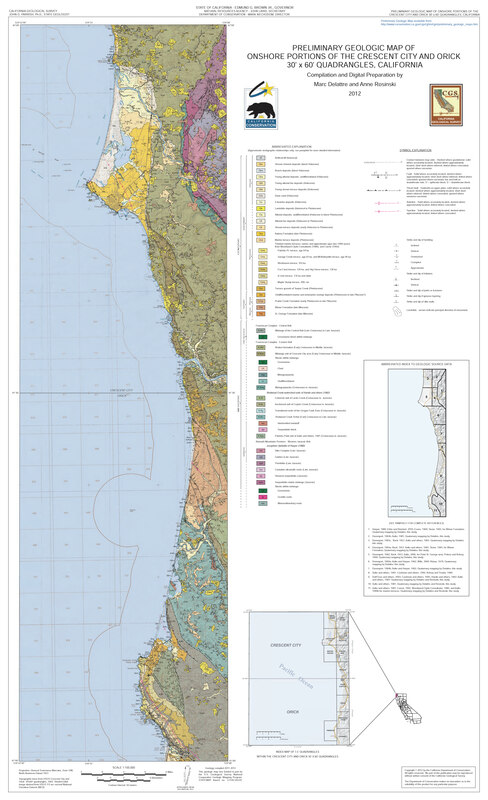 Preliminary Geologic Map of Onshore Portions of the Crescent City and Orick 30′ X 60′ Quadrangles, California, State of California, California Geological Survey, Sacramento, CA. Ogle, B.A., 1953. Geology of the Eel River Valley Area, Humboldt County, California in California Division of Mines Bulletin 164, 128 pp. Wentworth, C.K., 1922. A Scale of Grade and Class Terms for Clastic Sediments in Journal of Geology, v. 30, p. 377-392. These are all from Jacqui Houghton on yt here. Geology 335 course web page.